Infrared (IR) communication is a widely used and easy to implement wireless technology that has many useful applications. The most prominent examples in day to day life are TV/video remote controls, motion sensors, and infrared thermometers. In this tutorial I’ll first explain what infrared is and how it works. 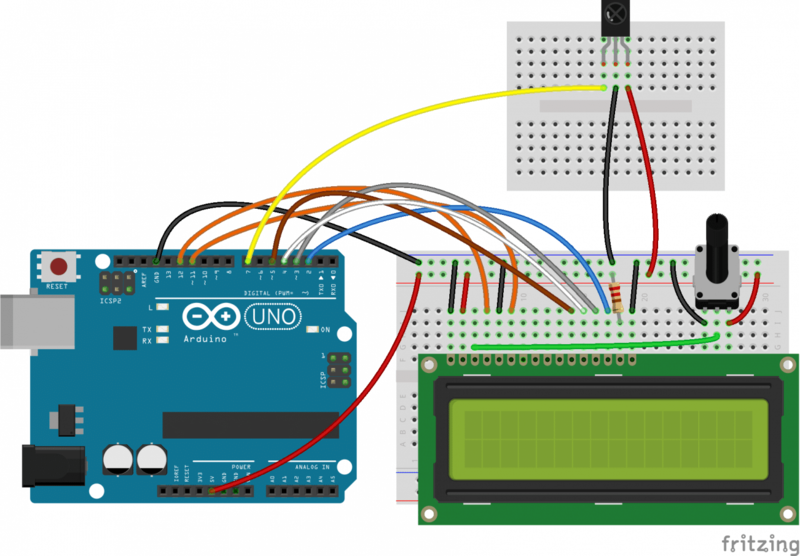 Then I’ll show you how to set up an IR receiver and remote on an Arduino. 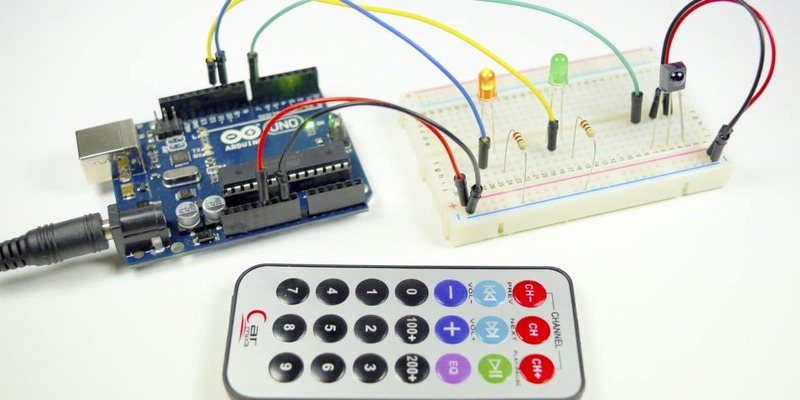 I’ll also show you how to use virtually any IR remote (like the one for your TV) to control things connected to the Arduino. Because IR is a type of light, IR communication requires a direct line of sight from the receiver to the transmitter. It can’t transmit through walls or other materials like WiFi or Bluetooth. IR light is emitted by the sun, light bulbs, and anything else that produces heat. That means there is a lot of IR light noise all around us. To prevent this noise from interfering with the IR signal, a signal modulation technique is used. The modulated IR signal is a series of IR light pulses switched on and off at a high frequency known as the carrier frequency. The carrier frequency used by most transmitters is 38 kHz, because it is rare in nature and thus can be distinguished from ambient noise. This way the IR receiver will know that the 38 kHz signal was sent from the transmitter and not picked up from the surrounding environment. 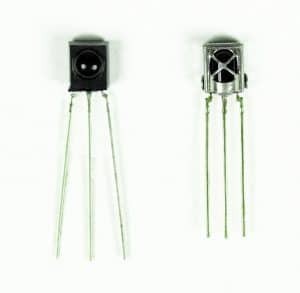 The receiver diode detects all frequencies of IR light, but it has a band-pass filter and only lets through IR at 38 kHz. It then amplifies the modulated signal with a pre-amplifier and converts it to a binary signal before sending it to a microcontroller. The pattern in which the modulated IR signal is converted to binary is defined by a transmission protocol. There are many IR transmission protocols. Sony, Matsushita, NEC, and RC5 are some of the more common protocols. 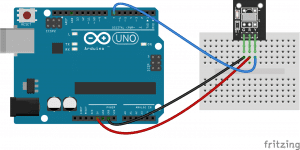 The NEC protocol is also the most common type in Arduino projects, so I’ll use it as an example to show you how the receiver converts the modulated IR signal to a binary one. This is how the NEC protocol encodes and decodes the binary data into a modulated signal. Other protocols differ only in the duration of the individual HIGH and LOW pulses. Each time you press a button on the remote control, a unique hexadecimal code is generated. This is the information that is modulated and sent over IR to the receiver. In order to decipher which key is pressed, the receiving microcontroller needs to know which code corresponds to each key on the remote. There are several different types of IR receivers, some are stand-alone, and some are mounted on a breakout board. 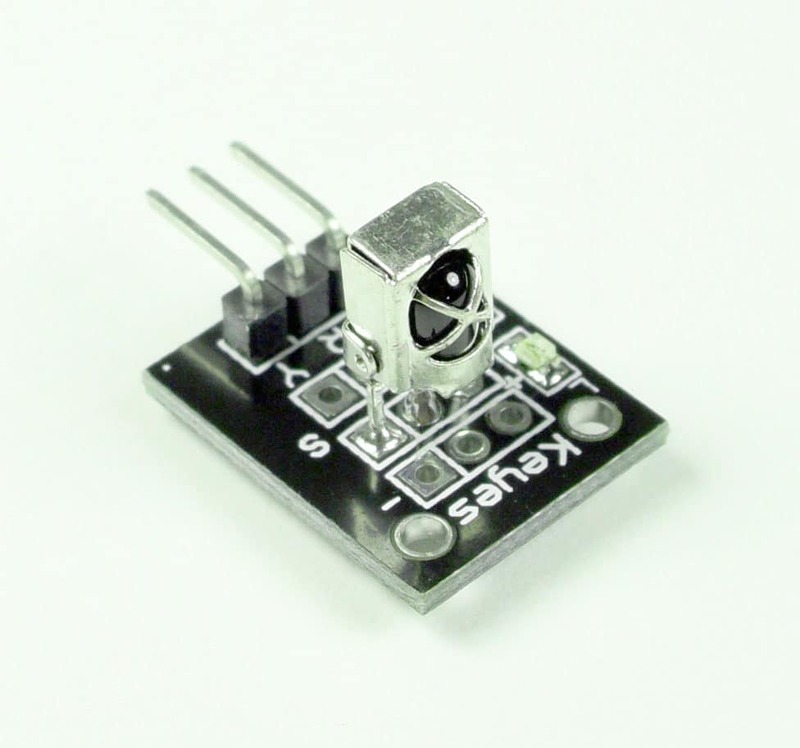 Check the datasheet for your particular IR receiver since the pins might be arranged differently than the HX1838 IR receiver and remote set I am using here. However, all IR receivers will have three pins: signal, ground, and Vcc. 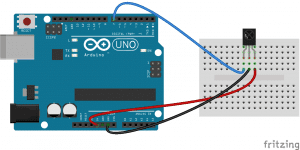 Once you have the receiver connected, we can install the Arduino library and start programming. 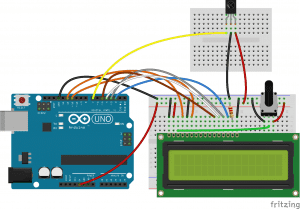 In the examples below, I’ll show you how to find the codes sent by your remote, how to find the IR protocol used by your remote, how to print key presses to the serial monitor or an LCD, and finally, how to control the Arduino’s output pins with a remote. We’ll be using the IRremote library for all of the code examples below. You can download a ZIP file of the library from here. 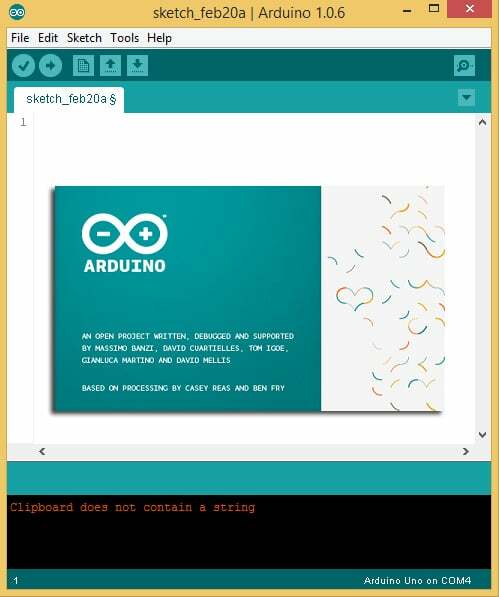 To install the library from the ZIP file, open up the Arduino IDE, then go to Sketch > Include Library > Add .ZIP Library, then select the IRremote ZIP file that you downloaded from the link above. Now press each key on your remote and record the hexadecimal code printed for each key press. Using the program above, I derived a table of keys and their corresponding codes from the remote that came with my HX1838 IR receiver and remote set. Note that you will receive a 0XFFFFFFFF code when you press a key continuously. Knowing which protocol your remote uses can be useful if you want to work on some more advanced projects. Or you might just be curious. The program below will identify the protocol used by your remote. It even works on most remote controls around your house. In these lines, when the hex code 0xFFA25D is received, the Arduino prints “CH-“. 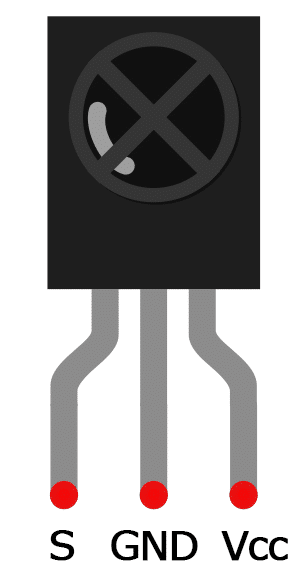 For any IR communication using the IRremote library, first we need to create an object called irrecv and specify the pin number where the IR receiver is connected (line 3). This object will take care of the protocol and processing of the information from the receiver. The next step is to create an object called results , from the decode_results class, which will be used by the irrecv object to share the decoded information with our application (line 5). In the void setup() block, first we configure the serial monitor baud rate. Next we start the IR receiver by calling the IRrecv member function enableIRIn() (line 10). The irrecv.blink13(true) function on line 11 will blink the Arduino’s on board LED every time the receiver gets a signal from the remote control, which is useful for debugging. In the void loop() block, the function irrecv.decode will return true if a code is received and the program will execute the code in the if statement. The received code is stored in results.value. Then I used a switch to handle each IR code and print the corresponding key value. When you receive a repeat pattern, then the previously stored value is used as the current key press. At the end of the void loop() section, we call irrecv.resume() to reset the receiver and prepare it to receive the next code. The resistor sets the LCD’s backlight brightness. It can be anything from 200 ohms to about 2K ohms. The potentiometer sets the character contrast. I normally use a 10K ohm potentiometer for this one. Again, if the hex codes don’t match the codes output by your remote, just replace them for each character where it says case 0xXXXXXXXX;. Now I’ll show you a simple demonstration of how you can use the IR remote to control the Arduino’s output pins. 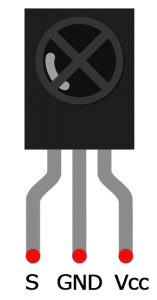 In this example, we will light up an LED when a particular button is pressed. You can easily modify the code to do things like control servo motors, or activate relays with any button press from the remote. 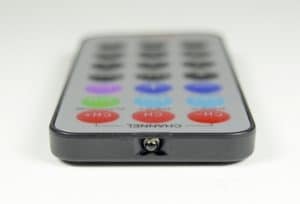 case 0xFF38C7: //Keypad button "5"
case 0xFF18E7: //Keypad button "2"
So far we have covered the properties of infrared radiation and how communication happens between the transmitter and receiver. We saw how to identify the IR key codes for a given remote control. 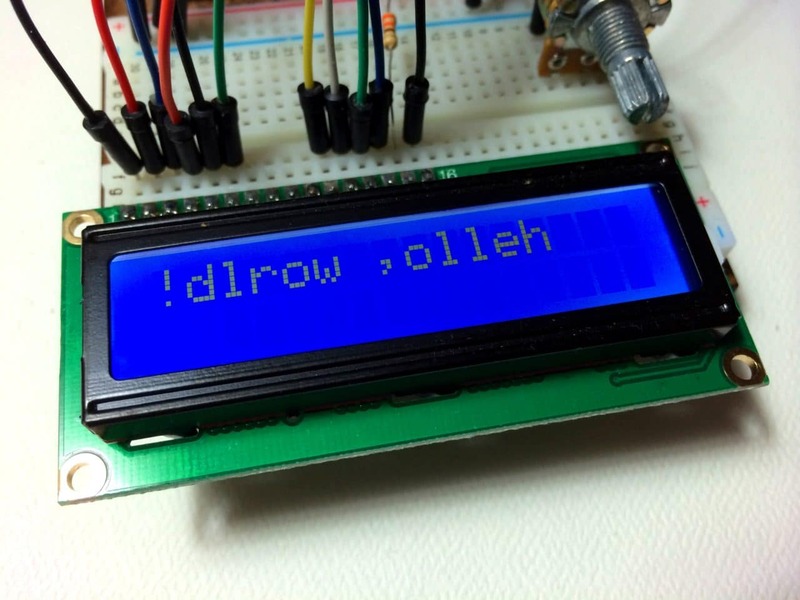 We learned how to display key presses on serial monitor and on an LCD screen. 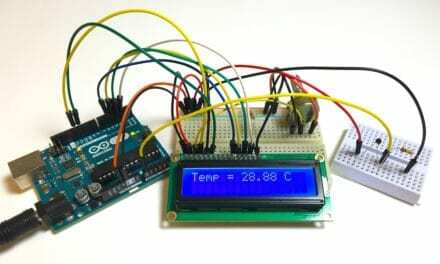 Finally I showed you how to control the Arduino’s output with the remote. Have fun playing with this and be sure to let us know in the comments if you have any questions or trouble setting this up! Krishna Pattabiraman is a frequent guest writer on Circuit Basics and the founder of www.codelectron.com. A well presented, informative and useful overview including specific examples for implementation. Bravo. A very well written and informative article. One thing I would have liked to learn more about is how to choose the IR emitter and receiver. My local store stocks several options of each, does it matter which one I choose? Well written, clear and concise. Keep it up. Hello hope that you all are fine. my Ir reciever giving me continous values on serial moniter although i am sending no signals to it. kindly reply. Hi, late but hopefully still helpful, if not for you maybe for somebody else. This error-message occurs when you’re using the “Robot IR Remote” library instead of the “IRremote” library, which you would first have to import, either by using the buildt-in feature of the Arduino-IDE, or by downloading a ZIP-archive. How to remove receiving NEC repeat code. From my remote control it always display 0xFFFFFFFF but when i presses key fast at once it display correct value like 18E7E817 so how to turn off receiving repeat code. Please help. If you have problems like “error: ‘TKD2’ was not declared in this scope – int RECV_PIN = TKD2; // the pin the IR receiver is connected to” just remove the “RobotIRremote” default library and install the “Arduino-IRremote-master”. 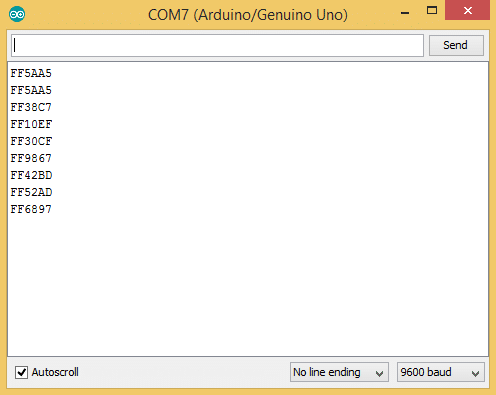 Then rename the folder “Arduino-IRremote-master” in “IRremote”. That’s all. i connected atmega 328 ic with 4 relayes. really, i made that using two cycles one for the ic and the ir receiver. 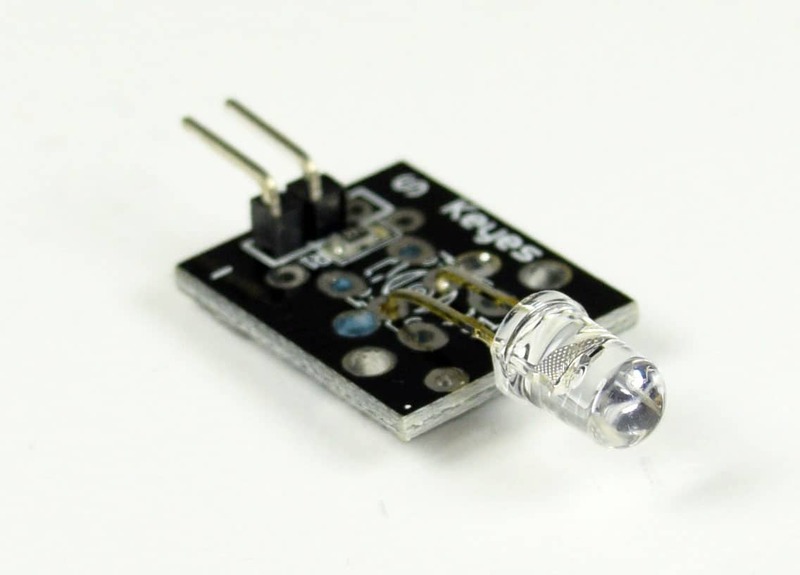 the cycle was supported using 5v (2 amp) adapter. The other cycle contained 4 relayes, each one have 1 daiods and 574 transistor. this cycle was supported using 5v (1 amp) adapter. those cycles were conected from (a)- cathode (b)- the ic’s output pins to the transistors. the target was to open/close each relay by lg-tv remote control. the cycle work very will through 1 hour from starting point, but after that it hang and not receive the signals. um looking forward to hearing from you, why this problem is happened. for some reason the program never finishes uploading onto my uno. The program verifies properly and I see some on the memory usage figures but it just never finishes. Any ideas? this article is very informative..keep sharing…..
I’m stuck at the LCD part. I am relatively confident I have connected everything properly, as I have checked and rechecked. However nothing displays on the screen. Is there a way to trouble shoot this? Its working now! Sorry, I turned on serial monitor in arduino and it started to work. Coincidence? 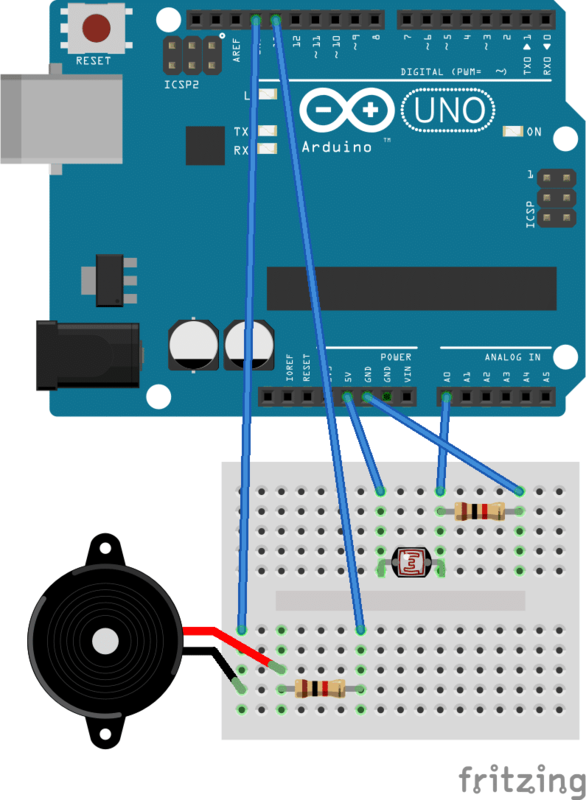 I have been looking for an understandable explanation how to use a IR receiver with Arduino for a while. Your explanation is the first that is simple and understandable for a beginner. Thanks to put such good quality information on this site. Very well written tutorial. Thanks! Is there a way to speed up the response when the remote button is pushed? There seems to be about a 3-4 second delay between button push and LED response in most cases. Wow, this was actually exciting and fun. Each piece of code worked. I could read the codes. It told me the manufacturer. Now I’m ready to buy a used/discarded remote from a thrift store, map its keys, and use it to drive relays. Thanks very much for short clear instructions. 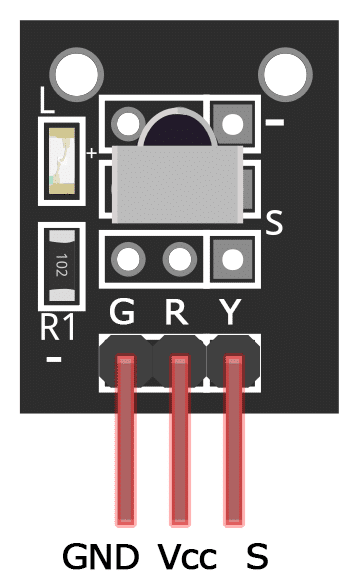 My 3 IR receivers are always blinking even before I add the code, and aren’t receiving any data sent from a functional RGB remote controller. Very informative and helpful, thanks! One question though, why can’t I identify the protocol of my garage door remote? I can do it with the tv remote just fine but the garage door opener I can’t. Doesn’t it use IR as well? when i try to get the codes for my remote after clicking the serial moniter it automatically starts giving the values why?? here regularly. I am somewhat certain I will be told a lot of new stuff proper right here! I am actually thankful to the owner of this web page who has shared this wonderful article at here. I am keerthy, a student of mechanical engineering. I followed the above said steps everything worked properly except one. In the part of printing the keys to the serial monitor, i had a difficulty. While compiling the codes after changing it according to my remote’s hexadecimal codes, it throws an error saying that the variable is not declared in the scope. Help me to rectify my mistakes as fast as you can!!! likewise I believe the style holds fantastic features.